Just when there’s a huge amount of work to be done, tons of cleaning and washing, two back to back classes for the child to attend, maids giving a miss.. it’s just in these times, that I usually cook something fancy. Its like, I already have so much work, a little more would not hurt. And then there are those times, when I can get so lazzy…. that I don’t clean or cook or run mad for classes and the maids also turn up. In those beautiful moments I *sigh*, I loiter, procrastinate, laze, enjoy a sleepy happy nap in the afternoon sun(Yea.. I love sunny naps.. when my eyes squint and thoughts dreamy and quixotic). I am like that. 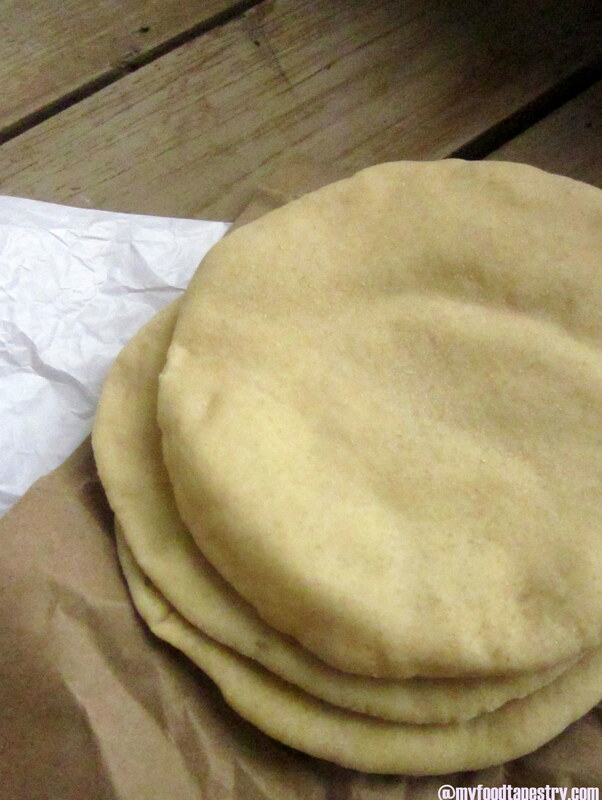 So, on yet another busy harried day, I tried my hands at baking pita bread. And when you’re on a roll, you just can’t seem to stop. In effect, a greek yoghurt dip and a Gyro sandwich was churned up. You know how it is when one thing leads to another. Thats what happened to me too. 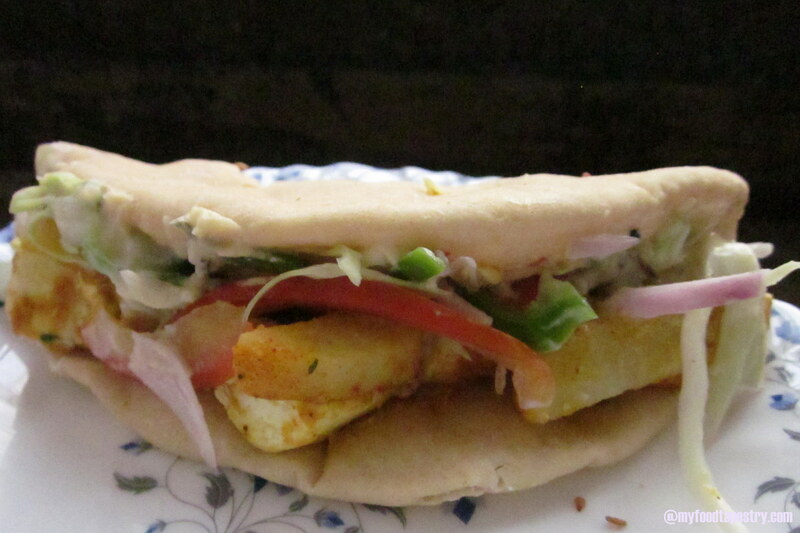 With pita read, some tzatziki, hummus, tandoori paneer and potatoes, we assembled a vegetarian version of the famous Gyro Sandwich! Yumm! 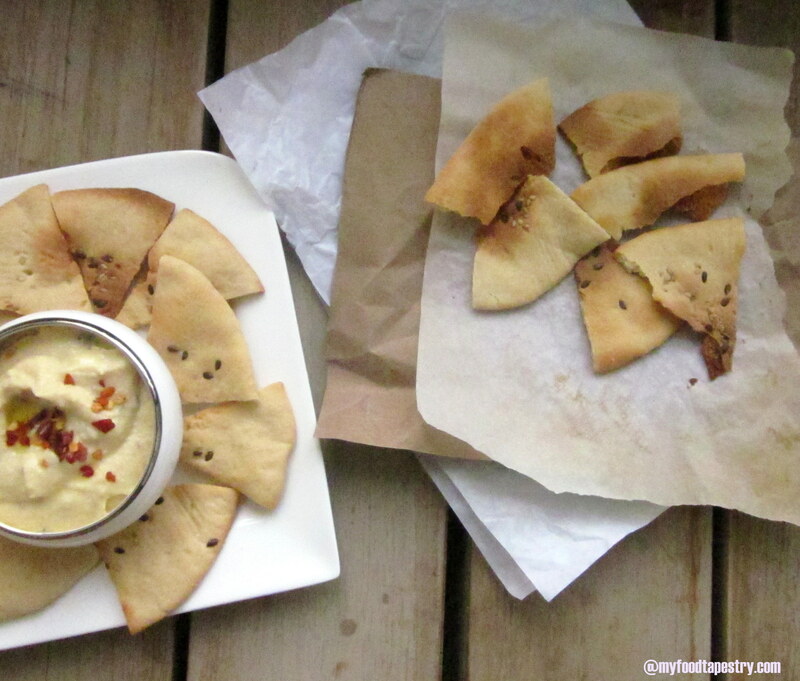 Also for dinner that night: Baked crisp pita bread served with oil loaded hummus. Cool eh? Now getting down to some serious business. Proof the yeast. Take both flours, salt, honey, oil and proofed yeast in a bowl. Using water, knead into a soft dough. Knead further until the dough is very soft and elastic, but is not sticky. Shape the dough into a ball and place in an oiled bowl, rolling the dough in the bowl so it is well coated with the oil. Cover and keep aside to rise till double, for about 1 1/2 hours. Once doubled, punch the dough to release some of the air and divide it into 8-10 equal pieces. Shape each piece into a smooth ball. Lightly dust your work surface with flour and roll out the ball to about 1/4″ to 1/8” thick (not as thin as a chappathi). If your dough does not roll out well let it rest for about 20 minutes and the roll it out again. Let the rolled out pitas rest for about 10 minutes, if you are using flaxseed and sesame seed, sprinkle on the bread before baking and then bake them on a baking sheet at 220C (430F) for about 5 to 6 minutes till well puffed up and cooked. 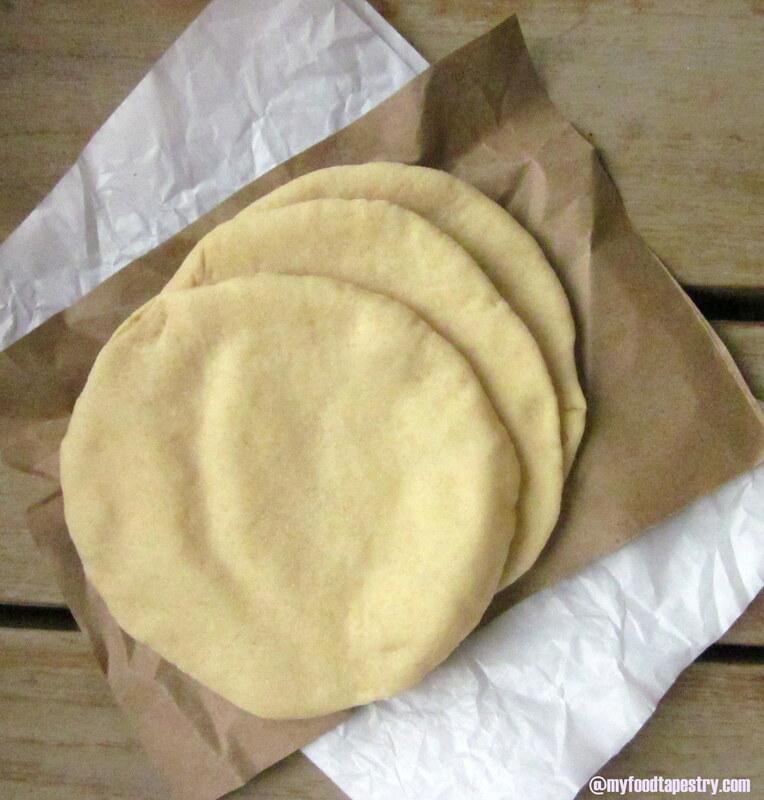 If you want crisp pitas you can bake them a little longer, but for making Gyros you need the pitas to be soft. Place them on a tack or a clean cotton towel to cool so they do not become soggy. Note: I used exactly half the aforesaid quantity and it was good enough to feed 3 people. 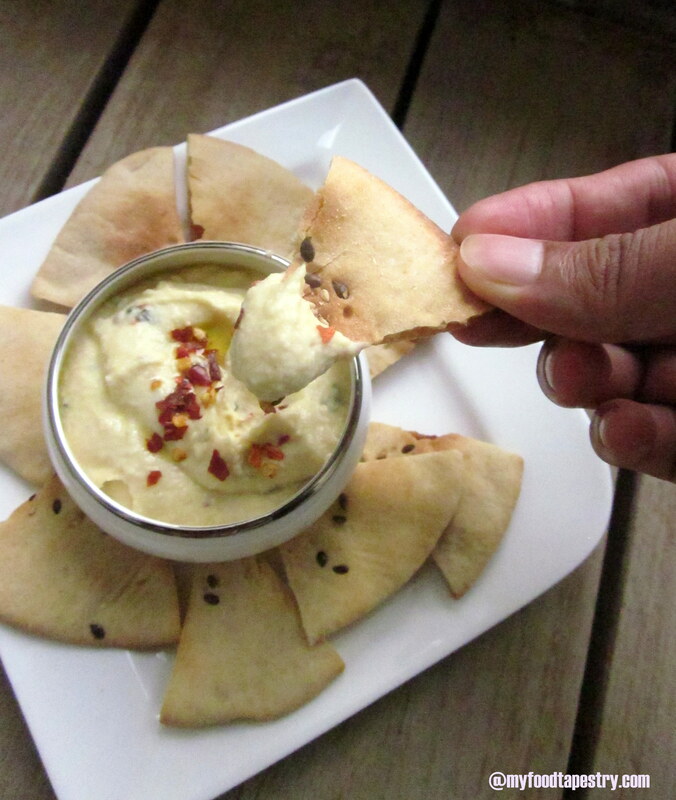 Crisp pita dotted with flax seeds and sesame seeds, served with hummus. 200 gms paneer, cut into cubes. Mix together curd, chick pea flour, spices and coriander leaves. 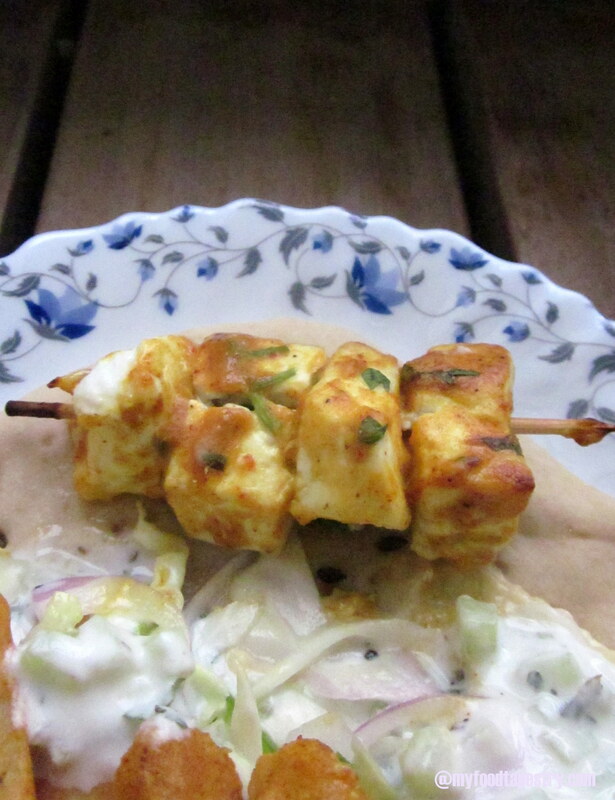 Marinate the paneer and potato in this spicy tandoori marinade. Leave for at least 30 minutes. I kept mine for 2 hours. Once done, preheat an oven or a flat griddle, and bake these beauties on parchment lines paper till golden brown. Take care not to over bake or cook else the paneer will turn rubbery. Serve as required. Mix together all the ingredients except the cucumber till blended well. Sprinkle some salt on the finely chopped cucumber and keep aside for about 20 minutes. Squeeze out the water from the cucumber to dry it out as much as possible. Fold in the drained cucumber, garnish with more mint and refrigerate for about an hour before serving. Note: Please don’t skip the honey, it adds much taste to this dip. A Gyro is a popular American-Greek street food, thought to have its origins in the Turkish Doner Kebab or Shawarmas.the name Gyro comes from the spiced meat for the sandwich, which is cooked on a revolving vertical spit from which thin strips are sliced off. Pronounced as “Yeer-Oh”, what I have here is a veggie version of it. You could even think of this as a paneer shawarma. Take one pita bread, on one half of it, the drama enfolds: Spread a tablespoon of hummus, some fresh Julienne veggies like cabbage, capsicum, onions and tomatoes. 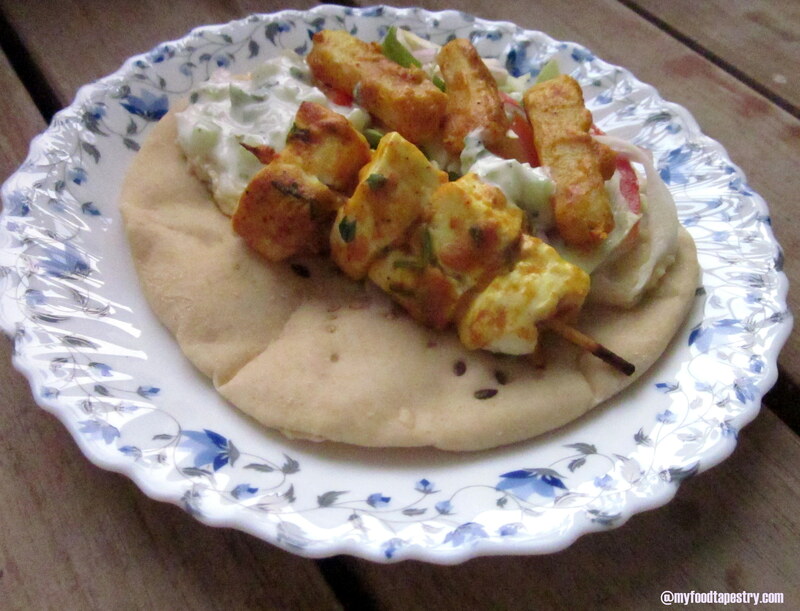 Place your tandoori paneer and potatoes. Top with Tzatziki – add as much as please. Fold the other half bread over it. I know the post is long, bear with me. I have been terribly busy lately. So, to publish 3-4 different posts seemed much harder than making a single one. I have a whole line of recipes coming soon(cooking a lot lately), so clubbing two-three smaller ones seems like the correct thing to do. Do drop a line if you think otherwise. 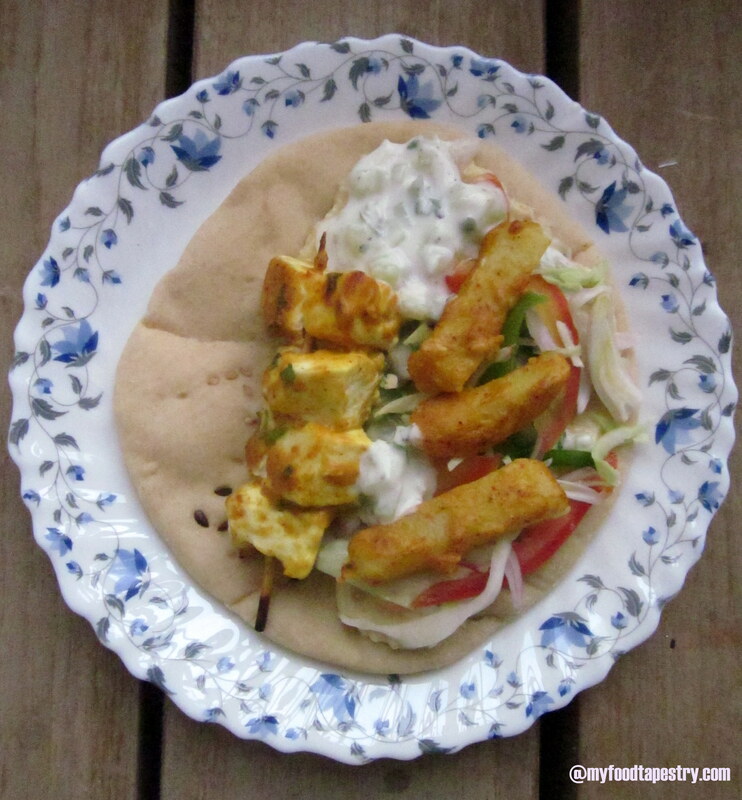 This looks so appetising, the pittas looked absolutely soft and fluffy and the different stuffing you made…. Oh can you please make some for me? I never had success with pitta so will give this ago at some stage. How long did it take you in total just for the pittas? Thanks Chintal. Wish I could make some for you. 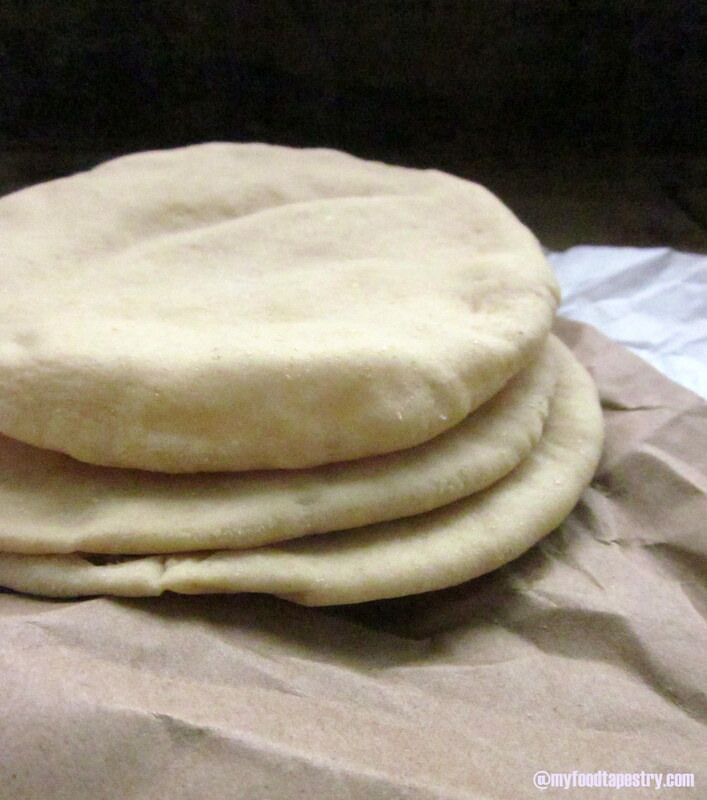 Just pitas hardly took time, if you have a well risen dough, then just 5-5 minutes to make the bread. But in total, I think it took me 4 hours. High Time! Namrata Jain, you are now forbidden to put teasers on your FB page before the recipe. On a serious note: Fabulous job! 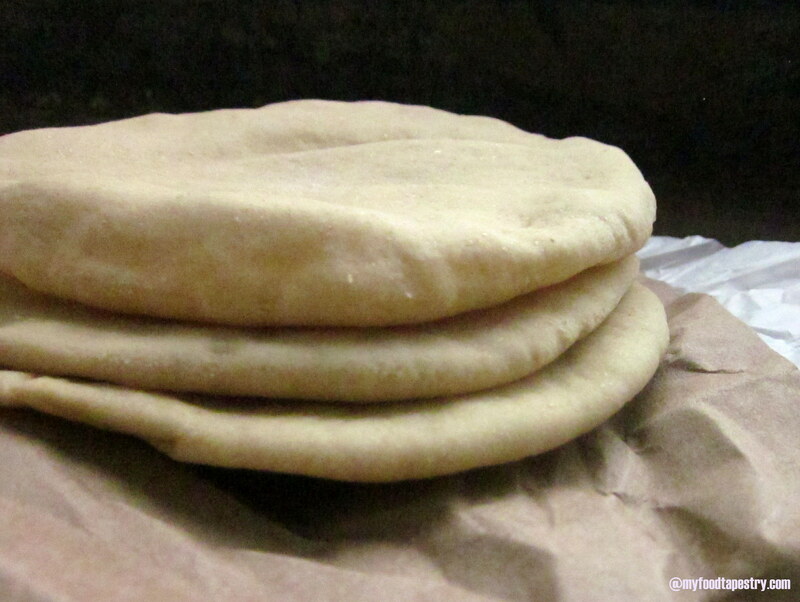 Beautiful pictures, of Pitas especially. That sandwich has Vinay drooling my comp screen. Loving all the elements of the dishes you have made Namrata! And oh my the pitta so soft and fluffy! Will so be making them for my family x Thanks for sharing! Thanks Dimple. Please do and let me knw how they turned out. Thank you Elson. I’m really not very good at it either.. but somehow flatter breads work for me.. not whole loaves. I have had such disasters, that it got pretty demotivating. 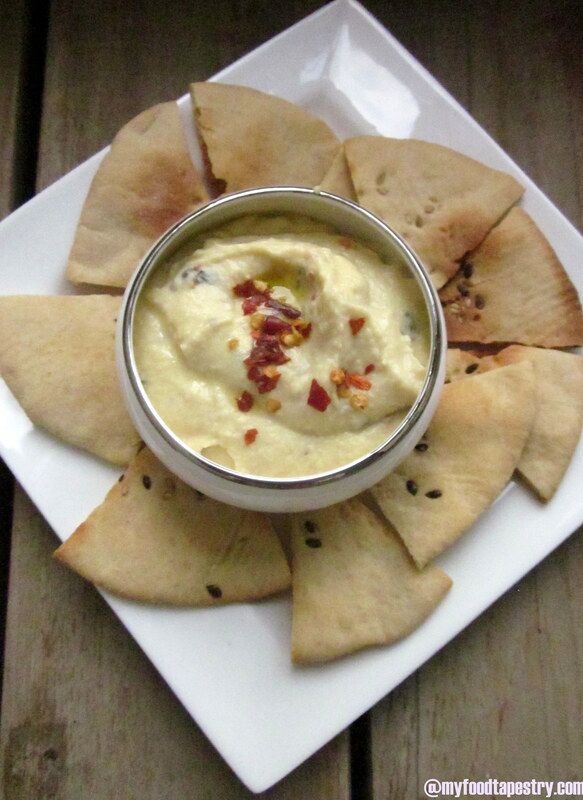 Ive been hunting for a good Pita bread recipe for days and these pictures just make me want to run to the kitchen now and give this a try. I am exactly like you in the sense that I can never just cook one thing. Quick question – does all purpose flour = maida. I typically use Maida for all my other bread baking but wanted to check 🙂 Great job! Hi. Thanks for stopping by. Yes, all purpose is maida. Maida works beautifully where a good soft bread is concerned. Hope you have fun making these. OMG Namrata… I love Gyros and the best ones I had were in Michigan. Amazing and this one is a star because it has tandoori paneer and Aloo too.. You surely came back with a bang and I am in love with it. Reblogging it..I hope it is okay with you :). Awesome superlicious and fabalastic job :). Of course you can re blog it. I am so going to try it :). 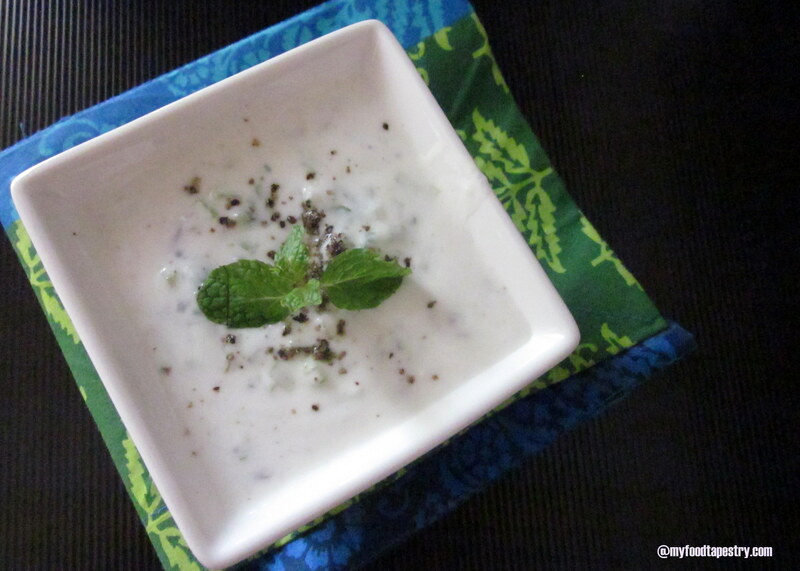 I liked the idea of adding besan to dahi for marinating. I know.. 3 in one …actually not a very good thing to do, but the recipes were all inter related, so couldn’t help myself. I’ve never had the real NYC gyros… but whatever we made that day was SO worth all the effort! Thank you for putting together some aromatic, adorable ideas and recipes. Now this is interesting. We like tzatziki so it leaves out pita bread. A must try! I am yet to get in the roll of thing! Till then this bread resides in my bookmarks! Thanks for your lovely comment at my place.